War has taken its toll on rural areas under Ukrainian government control in Luhansk region. There’s little sign of relief or policy. Smallholder farms in the Novoaidar region of Luhansk Oblast. Photo courtesy of the author. All rights reserved.The armed conflict in Ukraine’s Donbas has divided the region into government- and separatist-controlled areas. In Luhansk Oblast, the frontline for most of its length is the Siversky Donets River, which is also a historical dividing line. To the south is the coal-rich Donets Upland, the “true Donbas” that was largely unsettled before industrial development in the 19th century. Today almost all of this territory is part of the unrecognised “Luhansk People’s Republic.” To the north are three small industrial cities and a vast rural region of black earth and chalk hills controlled by the Ukrainian government. This territory is historically more associated with Slobozhanschyna, the region of free Ukrainian peasants centered around Kharkiv. When its residents left for factory work in Luhansk, they would often say they were “moving to the Donbas”. This rural half of the region contains some of the best and some of the worst news about the Donbas’ economy. A few huge agro-conglomerates and a thin layer of successful middle farmers are riding out the war on strong global markets for wheat and sunflower oil. 2017 saw the best wheat harvest in Luhansk Oblast in a decade even as industrial production bottomed out at 20% of pre-war levels. True, wheat prices in Luhansk Oblast are the lowest in the country due to the total degradation of the region’s roads and the loss of many grain elevators in the occupied territories. Nonetheless, large grain farmers have become a new economic elite in a region once dominated by industrial interests. Around 45,000 smallholder farming families live in small villages amidst these vast grain fields. Most have a few hectares of land, and traditionally sold vegetables, meat and milk to the industrial cities in the south. But with 11 of the 14 cities under separatist control, most smallholder farmers are cut off from their market. According to the UN Food and Agriculture Organization, these smallholders have halved the area under cultivation and are slaughtering their livestock at precipitous rates. Their average monthly incomes have decreased by 2.7 times since 2013 (from 390 to 144 USD). More than half of these households live in monetary poverty and one third in absolute poverty. Every third household has a member who has migrated to Russia or the EU in search of living wages. To this economic misery, Kyiv is adding a large dose of uncertainty related to tightened food sanitation standards being adopting as part of the Ukraine-EU Association Agreement. The reforms are eminently sensible and aimed at consumer protection, prohibiting the sale of low-grade milk to dairy plants and the sale of uninspected, home-slaughtered meat. But they fly in the face of current realities in Ukrainian villages, especially in depressed Luhansk Oblast. According to the oblast agricultural department, three quarters of the region’s cattle are raised by smallholders. With just a few licensed slaughterhouses left in the government-controlled areas, most of the meat produced will be slaughtered at home. There has been much talk in Kyiv and among international donors of encouraging investment in new processing facilities, but limited progress in attracting private capital to a frontline region with a depressed market and crumbling roads. Smallholders also account for 70% of milk production. Most of it does not currently meet the proposed new standards due to unsanitary cowsheds, insufficient refrigeration and poor transport practices by purchasers. None of these issues are irresolvable – with competent agricultural extension services and Canadian funding, family dairy farmers have greatly improved milk quality and profitability in nearby Dnipropetrovsk Oblast. But if a similar transformation is to be initiated in Luhansk Oblast, it needs to happen soon. Low prices and profound uncertainty have motivated smallholders to slaughter 1/3 of the dairy herd since the start of the war. Ruslan Markov, an expert in rural development for donor-funded programs in the Donbas, points out that the real challenges of complying with enhanced meat and milk regulations are compounded by the under-informed and demoralised state of the region’s smallholder farmers. When African swine flu was detected in several counties of Luhansk Oblast in 2016, smallholders panicked, massively slaughtering their pigs and selling the meat at a loss. This was largely as a result of rumours and bad advice. Markov claims that a similar “snowball” effect is possible among micro-dairy farmers if technical and material assistance isn’t forthcoming. 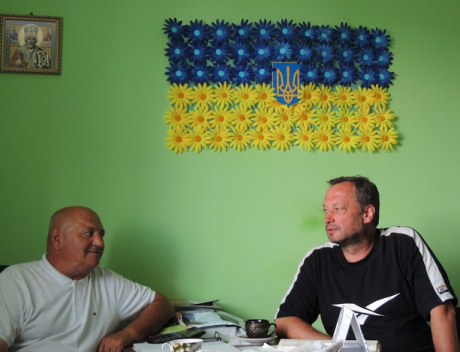 The town of Stanitsya Luhanska richly demonstrates the role that policy can play in the economic survival of rural residents. 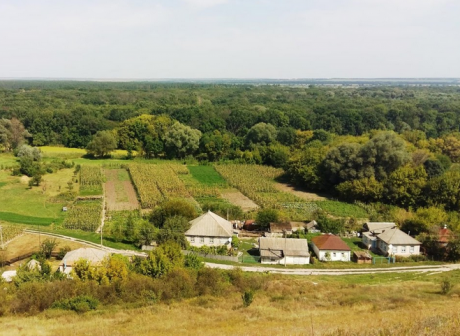 Just a few kilometres from Russia and just across the Siversky Donets from occupied Luhansk, Stanitsya was traditionally the city’s market garden, with hundreds of smallholders raising tomatoes, cucumbers, bell peppers and strawberries in plastic greenhouses. An iconic tomato even graces the town’s seal, hovering above a Cossack fortress. In the summer of 2014, hell came to Stanitsya Luhanska. For nearly nine months the town was pounded by light and heavy artillery, first by Ukrainian forces trying to dislodge the separatists and then by the latter once the city came back under government control. Farmers would work in their greenhouses until they heard the nearby roar of big guns then hurl themselves into nearby root cellars or makeshift bomb shelters. Nonetheless, dozens of people were killed. Hundreds of residents fled Stanitsya for Russia or other regions of Ukraine, and in 2015 vegetable production was no more than 15% of pre-war levels. It might as well have been zero. Marianna Nescheret, the informal leader and spokeswoman of Stanitsya’s greenhouse farmers, explains that in 2015 no sale at all was allowed across the frontline to Luhansk, and almost no buyers from the nearest government-controlled cities would take the risk. Farmers fed their vegetables to pigs or bulldozed them into ditches. “All we had left was hope,” says Marianna, though when I visited Stanitsya in 2015 as a humanitarian worker I saw precious little of it. 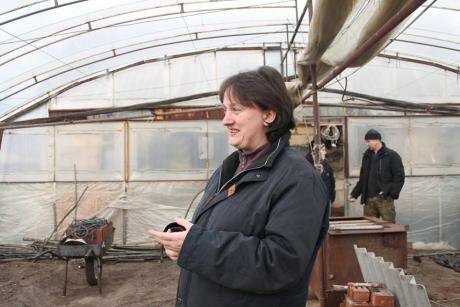 Left: Marianna Nescheret, informal leader of the greenhouse farmers in Stanitsya Luhanska. Photo by Lesya Ganzha. Right: a makeshift bomb shelter dug by a greenhouse farmer. Photo: Lesya Ganzha. All rights reserved.But in 2016, the Ukrainian authorities decided to permit sale of agricultural produce through the pedestrian crossing at Stanitsya Luhanska into the occupied territories. From a state of total destitution the greenhouse farmers suddenly found themselves positioned at the choke point to a vast and underserved market. This trade has pumped desperately needed capital into the war-ravaged town. Two years later most farmers have returned, patched up their damaged greenhouses and brought production back to normal levels. Thus, a policy change by Kyiv led to progress not just in the economic revival of this war-ravaged community, but in the struggle for hearts and minds as well. Good policy is needed to help the rural Donbas economy emerge from its profound crisis. And so is money – lots of it. The author asked two prosperous mid-sized farmers whether the capital accumulated by businessmen like themselves can be activated for rural development. Nikolay Zolotopup and Vladimir Karaschuk run the Zolote Farm, 2800 hectares of winter wheat and sunflower near the unassuming village of Nizhnya Pokrovka. They employ 49 locals from a population of 700, a much greater number than larger agribusiness firm would hire for the area under cultivation. Karaschuk claims they try to meaningfully employ as many young men as possible, knowing that out-migration has already put the village on the edge of disappearing. The local school is down to 56 children. The collective farm that preceded them in Nizhnya Pokrovka employed eight times more people. Besides grain farming, its workers tended to 9,000 pigs and an 800-head dairy herd. Today the collective barns are disappearing into thickets of elderberry bushes and the village has only a few hundred cattle held by smallholders. Market forces ruthlessly direct the Zolote farm towards a near-monoculture of wheat and sunflowers, a nationwide trend which along with mechanisation has steadily eroded rural employment. Zolotopup and Karaschuk have tried many times to diversify their operation, including vegetable production, broiler and pig raising, and most recently apple orchards. Each of these efforts has either been folded or accepted by the businessmen as a “social project” to be subsidised by their profitable grain farming. Larger agribusiness firms with a less intimate, paternalistic relationship with nearby villages simply avoid such investments altogether. Indeed, though these businessmen are among the few rural Ukrainians to truly prosper under market capitalism, their proposed solutions for reviving the rural Donbas assume a leading role for the government. The owners of the Zolote Farm, Nikolay Zolotopup and Vladimir Karaschuk. Photo courtesy of the author. All rights reserved.Karaschuk suggests that if Kyiv wants a more diverse rural economy and more employment it must be prepared to invest its own capital. Zolotopup believes the entrepreneurial potential of Nizhnya Pokrovka residents could be unleashed, but only with extensive training and consultation from the state. In describing villagers’ current readiness to open small businesses he breaks into surzhik, the mixture of Russian and Ukrainian typical of the region: yak eto vsyo zrobit? (“How do I even do it?”) He suggests a return to the late-Soviet practice of guaranteed state purchases of produce raised by smallholders, which gives them the certainty needed to invest their meager savings. Unfortunately, one of the most likely scenarios for the rural Donbas is that the perfect economic storm raging over the region’s smallholder farmers will accelerate their economic collapse, finishing off what production remains and accelerating labour migration. This scenario sees the region’s future as the domain of absentee agribusiness with a thin scattering of pensioners in disappearing villages. But this is not the only scenario. The government could expand the regulated sale of produce to the occupied territories and improve market infrastructure in remaining cities of the government controlled areas. Kyiv could launch material and technical assistance for smallholders to comply with the new meat and milk sanitary requirements, turning a looming threat into an opportunity. Government co-financing for agricultural diversification could be offered to help activate the dormant capital held by commercial farmers. There is precious little time to adopt such policies and end the dangerous neglect of the rural Donbas.